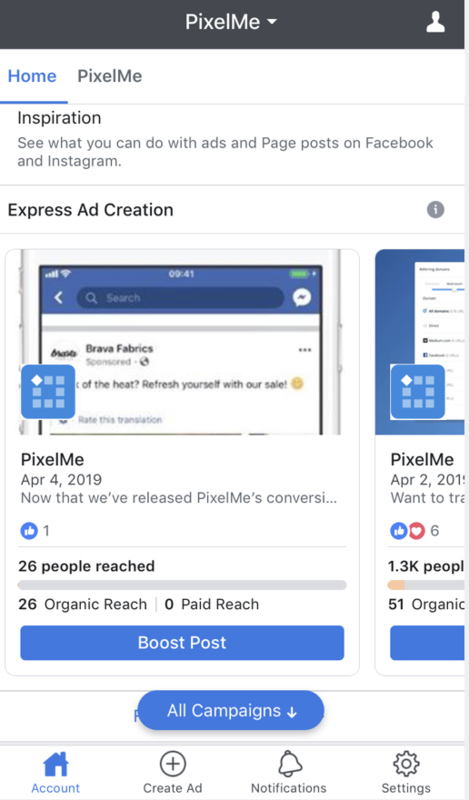 If you’re like any other advertiser running ads on Facebook, we’d all love a little more automation in our lives to free up our time (and money) for other work and more important things - like 👯‍♀️ or 🧘 or maybe even 🏄‍♂️. To save you even more time from cruising online to research which marketing tools are out there, here are our favorite 8 free tools you can start using to make it easier to create and optimize your Facebook Ads! The first 4 are tools Facebook provides already, and the next 4 are tools from other businesses. 💡What it is: Facebook Ad library was just released on March 28. Previously, its Facebook Ads Archive from 2018 only showed ads related to politics or national news. Their newly revamped library has expanded to show all active ads (even ones not targeted to you) from any advertiser 😮. 💎 Why it’s useful: If you’ve ever wanted access to the creative minds of your favorite brands, products, and businesses in your industry, you can now have at it! It’s super easy to find how any business runs their ads - and you have millions of ads at your disposal. See their active ads exactly as they’d look in News Feed, along with the ability to click through and play videos. You’ll have tons of free inspiration for content you can test (images, videos, headlines, benefits, CTAs), promotions to run, and ideas on how to more effectively launch campaigns from various business sizes, countries, verticals, and more. In the search bar, enter the name of a business in your industry you follow, a competitor, or a brand whose vision and marketing campaigns align with yours, etc. In the drop-down, select the Facebook Page of the business. Boom 💣 that’s it! As long as they have active ads running from their Page, you can browse through their ad creative and see the date of when the ad started running. 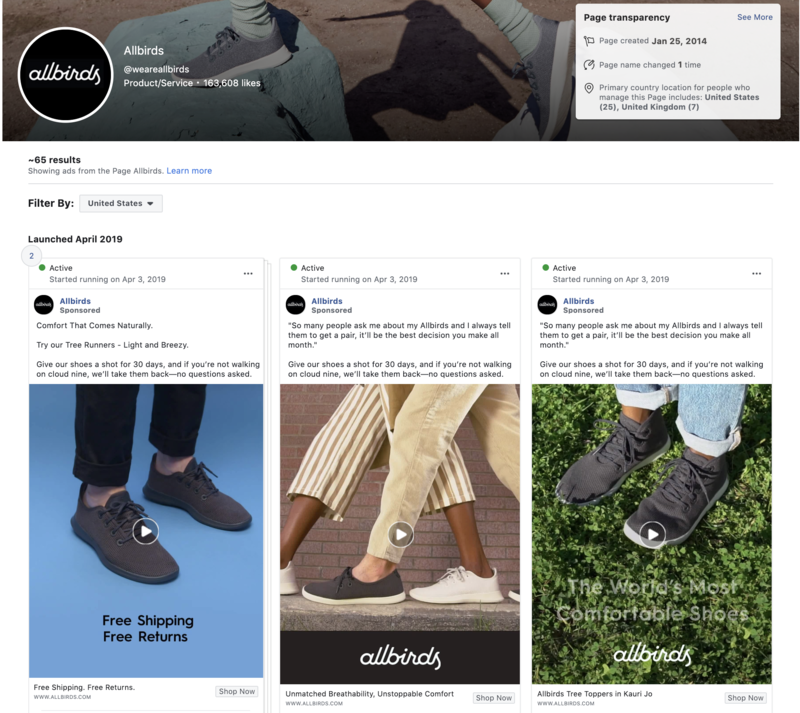 💡What it is: Facebook Analytics helps Marketers and Product Managers get omni-channel insights on how users move across a website, mobile app and key Facebook channels like a Page, Messenger bot, and soon Instagram (currently in beta! Here’s their request form). 💎 Why it’s useful: These days, people follow a business across many channels and devices before converting. This is where the value of Facebook Analytics come in, especially if you’re investing a lot of efforts on their platform. They let you create Event Source Groups to combine data from multiple sources (e.g. website and Facebook Page), which as a marketer you can use to look at specific user behaviors e.g. how many people first visit your site on their phone, then engage with a Facebook Page post, then add an item to their cart on your site from their computer. You can then turn those into Custom Audiences to retarget them to take the next step, or even create Lookalikes to find more people like your top customers. If you already have the Facebook Pixel on your site, just go to your Analytics dashboard to see your web analytics! Otherwise, learn how to setup a Facebook Pixel, then go back to facebook.com/analytics. To setup an Event Source Group, which combines data from multiple sources (website, Facebook Page, mobile app), first make sure you’re a Business Manager admin for each source. Then, follow the 3 steps from their FAQ here. 💡What it is: Automated Rules let you apply conditions based on spend, results, and frequency to your campaigns, ad sets, and ads. You can set the action to turn them on/off, adjust your budget, plus set a time range or attribution window for the rule, and even send out email notifications to yourself and other marketers on your team. 💎 Why it’s useful: If you’re in the weeds of managing your company’s Facebook ad campaigns, you know just how manual it is to constantly monitor, tweak, optimize. In the ideal world, you could set it and forget it (this applies to all things in life 😄), and Automated Rules gets you one step closer. You can create a checklist of KPIs and metrics you monitor when you review your ads on the regular (e.g. 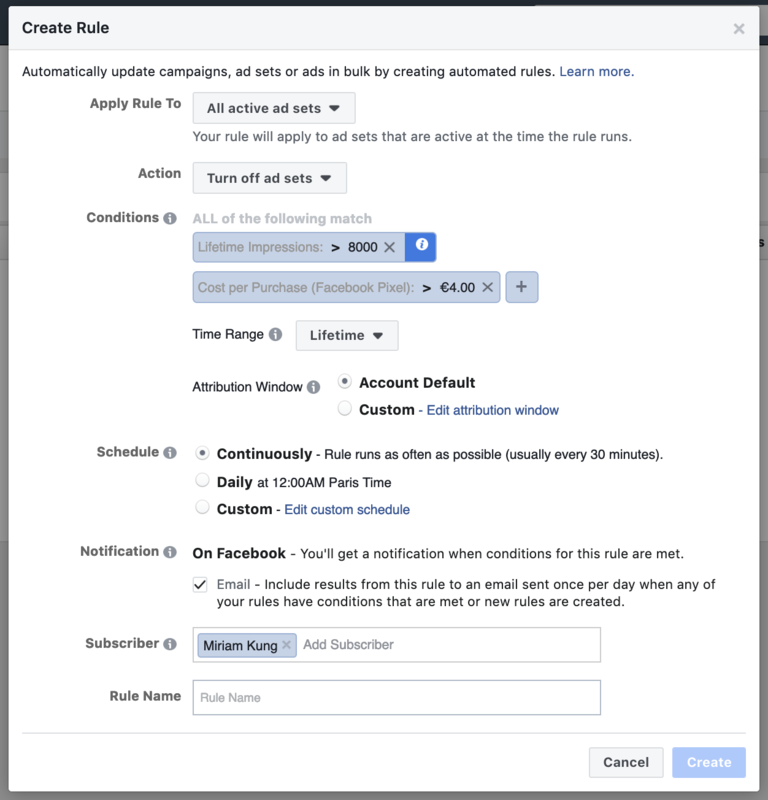 turn off ads if CPA goes over $25, turn off ad sets if CPC goes over $3.00) and use that as a baseline to setup rules and better manage your Facebook ad costs. Click the green “Create Rule” button on the top-right and setup your rules! 💡What it is: Launched in 2015, the app gives you easy access to see your ad results and analytics any time. 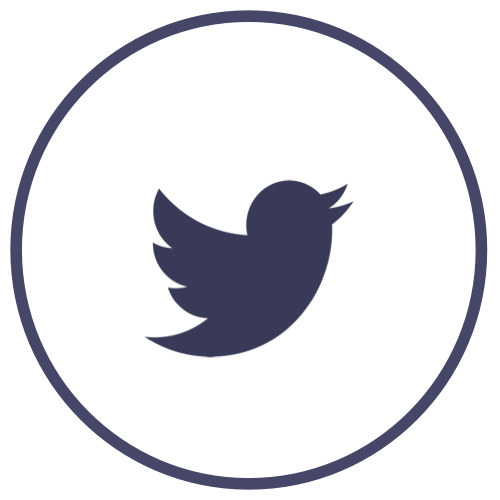 You can create new ads or boost your Page posts, plus make edits to the text, targeting or creative to optimize them, deactivate any ads that are underperforming (or reactive past ones), duplicate top performing campaigns, compare campaigns side-by-side, and more. It’s available on these devices: iPhone, iPad, Android. 💎 Why it’s useful: Ok I know, yet another app on your phone? If you’re an SMB though, you’re always on the go and this means creating new ads or editing existing ones on the fly and seeing results in real-time become much more manageable from your phone. You’re ready to go (while on the go)! 💡What it is: From the creators of Meltwater (analytics software), their Likealyzer tool gives you a free report of your Facebook Page. You can see what’s missing, how you compare with others, and what you can be doing better with some general tips e.g. add contact info to your About section, post more frequently etc. 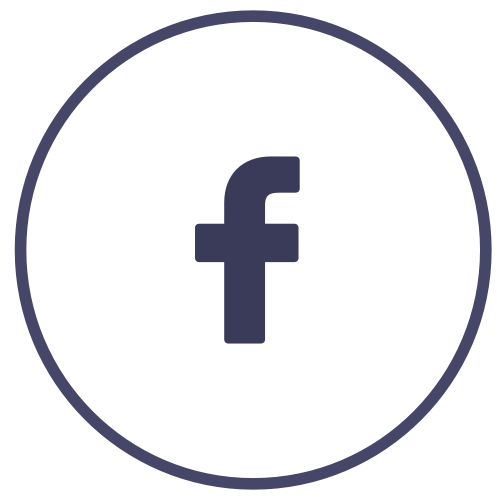 💎 Why it’s useful: Where Likealyzer comes in most handy, is the ability to see the Facebook Page report card of your competitors or growing companies, for new ideas on ways you can optimize your own. Above is an example for Spigen, a top Amazon seller for mobile accessories. With just a few clicks, you get different insights on how often they post, type of content they post - and see what else you can experiment with too. Note: for in-depth analysis of your own Facebook Page, your best bet is still Facebook’s Page Insights tool. See your Facebook Page report card! To get more up-to-date analytics, you can sign in with Facebook so they can pull in your latest data. In their own words: “Design anything. Publish anywhere. Design presentations, social media graphics, and more with thousands of beautiful layouts." 💡What it is: Canva is an online graphic design platform with over 100M designs (and used by a whopping 10M users! 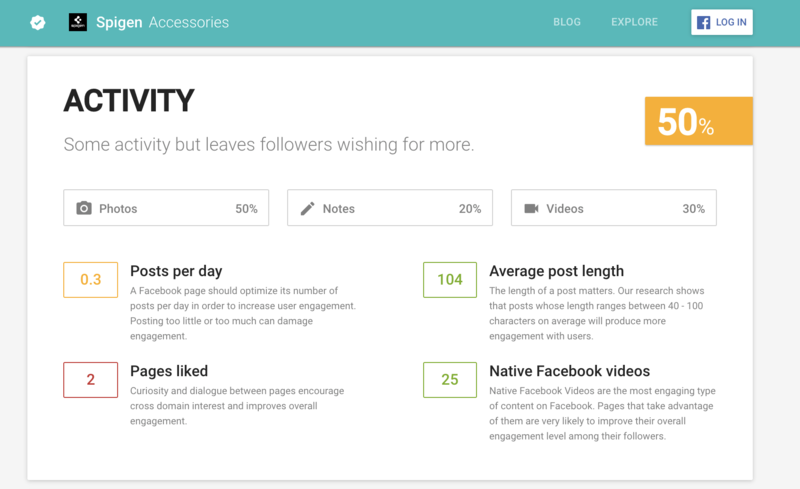 ), including templates for all your social media channels: Facebook posts, Instagram posts and stories, Twitter posts, YouTube thumbnails, Pinterest posts and more. They provide a wide range of fonts and color palettes, the ability to upload your own photos, and download designs as PNG, JPG, PDF or even an animation. 💎 Why it’s useful: If you’re strapped on design resources, Canva is a great way to get already built templates for your go-to marketing channels to make the creative setup part much easier. Think of it like a tool that lets you create Photoshop-level beautiful images with zero design background - it’s super user friendly. 💲Pricing: Free (1gb storage, 8K templates and more - overall, super generous for your core design needs) with paid plans (unlimited storage, access to their photo library, ability to use custom fonts, etc.). Sign up with a free account so you can save your designs and organize them. Then start designing away! Choose a design (e.g. Facebook Page post), then search for a template (or upload your own photo), customize it as you need, and finally download it to post to your channels. 💡What it is: Pexels provides a library with hundreds of thousands of high quality stock photos and even some videos, for all your ads or content needs. Every photo is part of the Creative Commons Zero license, which basically means unrestricted use. 💎 Why it’s useful: Having strong creative and images are key for boosting CPC and conversions in your ads. 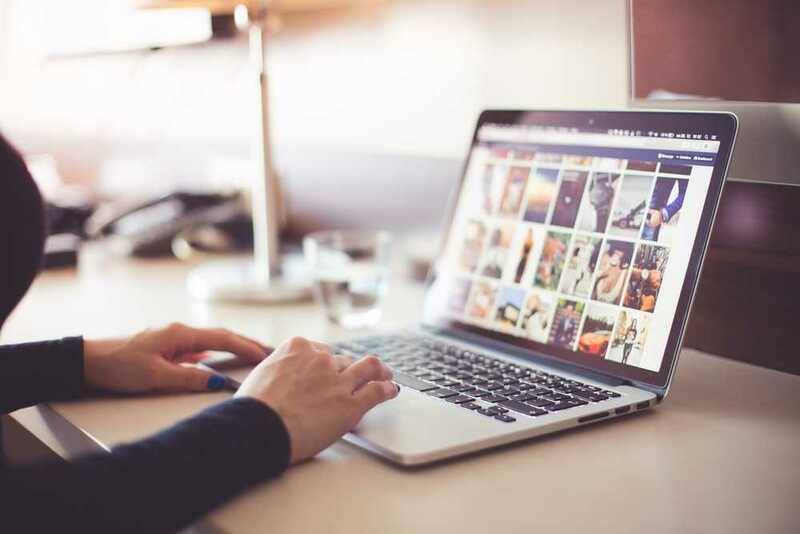 Pexels is an awesome, free resource if you don't have your own repository of images, or need fresh ones to test in your ads, content, and landing pages. They do have paid options (e.g. you can buy Adobe Stock images if you can’t find a specific one), but their library of free images is expansive and great for everyday ads and content needs. Search for any image you need, and save photos you’ve liked to a Collection so you can come back and find them later. 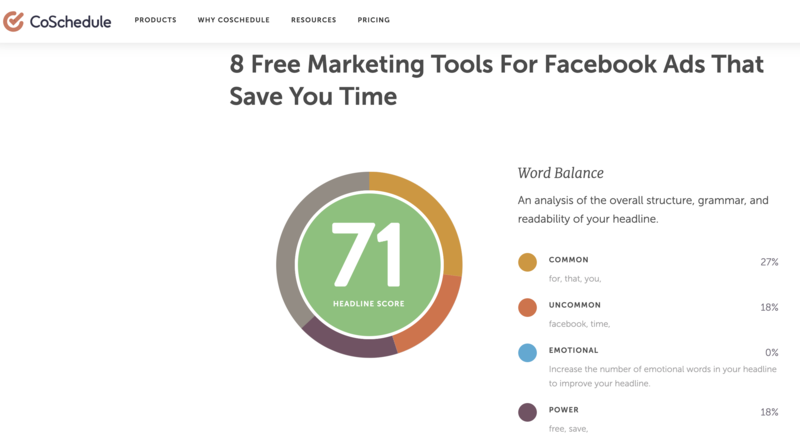 💡What it is: CoSchedule at its core is a marketing project management, content organization and social scheduling tool, but one of their great free tools is their Headline Analyzer. Just copy/paste some headlines you’re looking to test for your Facebook Ads and it’ll give you a score out of 100 on a number of dimensions: word balance, word count, character count. They also have tips for keywords to use (for SEO or search ads), sentiment (how much emotion is conveyed) and can even show you how the headline would look like in a Google Search ad. 💎 Why it’s useful: Headlines are like the first impressions for your ads or other content. Everyone has limited attention spans, so hooking them in from the start will make more people want to click into your ads. CoSchedule gives you a nice breakdown of tips for how you can improve and new headlines to get your audience's attention 👋. Type in your headline, then see your results! So that wraps up some of our favorite time-saving tools amongst a big sea of resources for Facebook Ads 🌊. If you’re looking to make your ads tasks more efficient, just know that you’re not the only one - hopefully some of the tools here can get you one step closer to getting more out of your time with even stronger ads 💪.